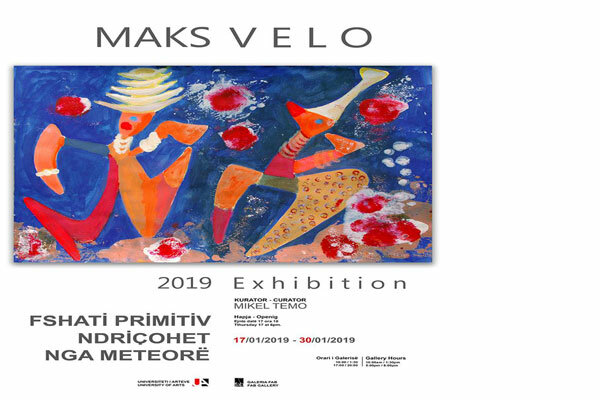 "The Primitive Village Illuminated by Meteors" is the title of the personal exhibition of the Albanian artist-painter Maks Velo. M. Velo is known to the public as an active architect, painter and activist. Already in its 80's, he continues to engage in creating images of a particular character, reminiscences of a perennial persecution that undoubtedly intertwined and illuminated by today's change. The Faculty of Fine Arts Gallery FAB has the honor to host you on 17/01/2019 18:00 at the opening of Velo’s exhibition and to become part of this colorful spectacle, a creative event for the author's personality which, as he himself says, "Now, dreams, imaginings, fantasies, and human appearances come in color". It took time for the black, the nightmare, the persecution, to fade away and to include a colorful life.